14 Jan 2013: First snowfall of the year, and it's a chance to see how good the loft insulation is, in our house and our neighbours. Well, it looks good at the north end, but the south end is disturbingly well melted. There is a thermal connection between roof and walls where they meet at the verge. I don't have the thermographic camera at the moment, but perhaps I can use my infra-red thermometer to get a few readings. We are not going to get any sunshine today!! 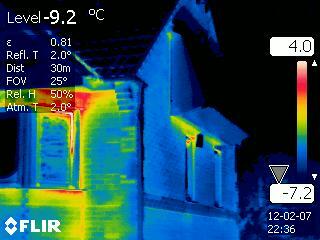 Here is my photo from one year ago, Feb 2012, showing that the bigger losses are from the thermal bridges around the windows - which is normal for non-Passivhaus british construction. Postscript 20th Jan 2013: After a week of snow on the roof, it is clear that the insulation is good. The reason for the uneven coverage on the first day was that there was a strong breeze from the south east and it was blowing the (then) very light powdery snow along the roof and it was building up at the north end. After a lightening of the breeze and a continuation of snowing, the coverage became even.